After an extensive period of iteration and a long but rewarding process of learning about package development, I am pleased to announce the release of my first R package. The package is called debkeepr, and it derives directly from my historical research on early modern merchants. debkeepr provides an interface for working with non-decimal currencies that use the tripartite system of pounds, shillings, and pence that was used throughout Europe in the medieval and early modern periods. The package includes functions to apply arithmetic and financial operations to single or multiple values and to analyze account books that use double-entry bookkeeping with the latter providing the basis for the name of debkeepr. In a later post I plan to write about the package development process, but here I want to discuss the motivation behind the creation of the package and provide some examples for how debkeepr can help those who encounter non-decimal currencies in their research. You can install debkeepr from GitHub right now with devtools, and I am planning to submit the package to CRAN soon. Feedback is always welcome and any bug reports or feature requests can be made on GitHub. After writing a couple of posts on my thoughts about digital humanities, I have concentrated on writing posts about using R to analyze and visualize historical data. I have always tried to adopt the perspective of a newcomer to code and to R, since I was in that position not all that long ago. The rsats community has done an admirable job in trying to make learning R as approachable as possible, but there is no way around the fact that learning to code is a daunting task. My posts have mainly focused on using R for GIS and network analysis since these are the two topics most pertinent to the digital humanities projects I have been working on. Writing posts on these topics proved to be the best way for me to learn not only how to create maps and network graphs with R but also about the fields of GIS and network analysis in general. Even if no one read my posts they would have been useful endeavors for all that I learned through writing them. However, the most gratifying aspect of writing this blog has been hearing that the content has proven useful to others in their efforts to learn R. It has been particularly amazing and amusing to hear from people in the sciences and think about biologists and chemists learning to code by analyzing letters from a sixteenth-century merchant in the Low Countries, which is the data set that I have used in my posts. I never could have imagined that this website and my blog posts would be read by very many people, and I have been amazed by the steady stream of visitors that continue to read the website daily. The digital humanities and rstats communities have been amazingly open and welcoming, and I never could have gotten this far nor had this much fun without the kindness of the people in these communities. I have received very generous encouragement and increased visibility through tweeting out my posts from Maëlle Salmon, Mara Averick, Hadley Wickham, and the great R4DS community among many others. To these individuals and to the entire community that has come to read my blog I can only say thank you. In a nice little coincidence this is the 11th post to the blog and pushes my first introductory post to the second page of blog entries. I am looking forward to the next year of continuing to learn more about digital humanities and R and writing about my experiences on this blog, pushing more and more posts to the second page and beyond. 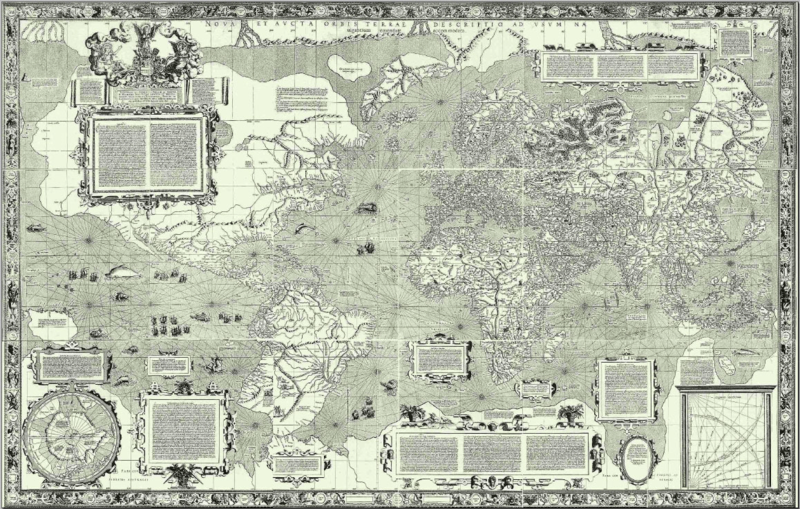 The Mercator projection was designed with certain uses in mind. Mercator’s emphasis on perpendicular lines of longitude and latitude and the equivalence of straight lines and rhumb lines were meant to simplify navigation and have recently proved useful for online mapping services. However, the stretching of latitudes towards the poles distorts the size of land masses, making those closer to the poles appear larger than those near the equator. The stress on rhumb lines in Mercator’s map also highlights the difference between lines of constant bearing (rhumb or loxodrome lines) and the shortest distance between two points (great circles). Due to Earth’s ellipsoidal nature, the shortest distance between two points is not necessarily a straight line. For instance, to fly from Los Angeles to Amsterdam, one would not want to fly in a straight line of constant bearing at 78 degrees. Instead, you would want to make an arc to the north to take advantage of the ellipsoidal shape of the Earth. By flying along the great circle from Los Angeles to Amsterdam one would travel 1120 kilometers less than flying along the rhumb line. My previous post provided an introduction to the sp and sf packages, showing how the two packages represent spatial data in R. There I discussed the creation of Spatial and sf objects from data with longitude and latitude values and the process of making maps with the two packages. In this post I will go further into the details of the sf package by examining the structure of sf objects and how the package implements the Simple Features open standard. It is certainly not necessary to know the ins and outs of sf objects and the Simple Features standard to use the package — it has taken me long enough to get my head around much of this — but a better knowledge of the structure and vocabulary of sf objects is helpful for understanding the effects of the plethora of sf functions. There are a variety of good resources that discuss the structure of sf objects. The most comprehensive are the package vignette Simple Features for R and the overview in Chapter 2 of the working book Geocomputation with R by Robin Lovelace, Jakub Nowosad, and Jannes Muenchow. This post is based on these sources, as well as my own sleuthing through the code for the sf package. In my previous post on geocoding with R I showed the use of the ggmap package to geocode data and create maps using the ggplot2 system. This post will build off of the location data obtained there to introduce the two main R packages that have standardized the use of spatial data in R. Thesp and sf packages use different methodologies for integrating spatial data into R. The sp package introduced a coherent set of classes and methods for handling spatial data in 2005.3 The package remains the backbone of many packages that provide GIS capabilities in R. The sf package implements the simple features open standard for the representation of geographic vector data in R. The package first appeared on CRAN at the end of 2016 and is under very active development. The sf package is meant to supersede sp, implementing ways to store spatial data in R that integrate with the tidyverse workflow of the packages developed by Hadley Wickham and others. There are a number of good resources on working with spatial data in R. The best sources for information about the sp and sf packages that I have found are Roger Bivand, Edzer Pebesma, and Virgilio Gómez-Rubio, Applied Spatial Data Analysis with R (2013) and the working book Robin Lovelace, Jakub Nowosad, Jannes Muenchow, Geocomputation with R, which concentrate on sp and sf respectively. The vignettes for sf are also very helpful. The perspective that I adopt in this post is slightly different from these resources. In addition to more explicitly comparing sp and sf, this post approaches the two packages from the starting point of working with geocoded data with longitude and latitude values that must be transformed into spatial data. It takes the point of view of someone getting into GIS and does not assume that you are working with data that is already in a spatial format. In other words, this post provides information that I wish I knew as I learned to work with spatial data in R. Therefore, I begin the post with a general overview of spatial data and how sp and sf implement the representation of spatial data in R. The second half of the post uses an example of mapping the locations of letters sent to a Dutch merchant in 1585 to show how to create, work with, and plot sp and sf objects. I highlight the differences between the two packages and ultimately discuss some reasons why the R spatial community is moving towards the use of the sf package. Over a wide range of fields network analysis has become an increasingly popular tool for scholars to deal with the complexity of the interrelationships between actors of all sorts. The promise of network analysis is the placement of significance on the relationships between actors, rather than seeing actors as isolated entities. The emphasis on complexity, along with the creation of a variety of algorithms to measure various aspects of networks, makes network analysis a central tool for digital humanities.1 This post will provide an introduction to working with networks in R, using the example of the network of cities in the correspondence of Daniel van der Meulen in 1585. This post begins with a short introduction to the basic vocabulary of network analysis, followed by a discussion of the process for getting data into the proper structure for network analysis. The network analysis packages have all implemented their own object classes. In this post, I will show how to create the specific object classes for the statnet suite of packages with the network package, as well as for igraph and tidygraph, which is based on the igraph implementation. Finally, I will turn to the creation of interactive graphs with the vizNetwork and networkD3 packages. This post will merely scratch the surface of the mapping capabilities of R and will not enter into the domain of the more complex specific geographic packages available for R.4 Instead, it will build on the dplyr and ggplot skills discussed in my brief introduction to R. The example of geocoding and mapping with R will also provide another opportunity to show the advantages of coding. In particular, geocoding is a good example of how code can simplify the workflow for entering data. Instead of dealing with separate spreadsheets to store information about the letters and geographic information, coding makes it possible to create the geographic information directly from the letters data. The code to find the longitude and latitude of locations can be saved as a R script and rerun if new data is added to ensure that the information is always kept up to date. Digital humanities holds the promise of increasing the means by which scholars are able to analyze and present data. Though some sentiments about the significance of digital humanities might be overblown, there is no doubt that the more ways we have to analyze sources the better. Learning a variety of the tools that make up the rather nebulous universe of digital humanities is like learning a new language. It opens up new possibilities that were previously closed or necessitated the expertise of others. This frames digital humanities as a collection of skills rather than a means to a predetermined end. I have adopted this perspective in learning about the possibilities opened by digital humanities and working on a digital humanities project. I am hardly the first person to take these steps, but I hope that by explaining my thought process I can set a basis for future posts on digital humanities. If there has been one guiding force in my approach to digital humanities, it is to learn skills and tools in the process of production. In a way, this is simply the application of critical thinking to how I create my scholarly work. Instead of doing things in what seems the de facto manner, I have sought to question if there is either a more efficient way or a way in which I could gain or improve my competency. The goal of efficiency was particularly significant in thinking about how to organize my research and writing (DH 1.0), while learning new skills has been more important in the production of digital humanities projects (DH 2.0). This may not be the easiest way to complete a project in the short run, but by doing things the hard way, I am looking to open up new opportunities for future projects. With this theoretical approach in mind, let me now discuss a few concrete principles of my digital humanities practices concerning text, applications, and producing digital humanities projects.